Sortie Charters offers fishing trips for all ages and skill levels. From jigging for big stripers off Devil's Bridge to trollling for blues off Nomans, it's your trip. Captain Alex Preston says, "This may be the first fishing trip for someone. A lot of charter captains think part of the business is yelling at their customers when they lose a fish. Not me. The only thing you can do wrong when you are out with me is not have a good time." Fishing for Striped Bass & Bluefish. Two trips are offered daily at 7AM and 1PM. All trip times include dock to dock travel. Any cleaning and filleting of the fish will happen at the dock. 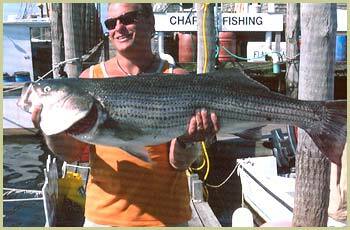 All charters include rods, tackle and bait, but fishermen are welcome to bring their own gear. The customer is responsible for any food & drink and please bring appropriate weather attire.